UNIT.R is a 4 piece band based in Cape Town who combine elements of electro, rock, punk and folk into a live set that goes beyond the traditional. Synthesisers and sequencers combined with live bass guitar, acoustic guitar, drums and vocals to produce a fresh sound whilst aimed squarely at the dance floor. Their sound is all about the synthesis of human and electronic, the marriage between the spontaneous soul of live performance and an intrinsic love of music production and song writing. UNIT.R is Justin de Nobrega (Max Normal TV, Considerate Builders Scheme) on synths and vocals and his brother Mathew de Nobrega (Artifakt – Timecode records) on acoustic guitar, vocals and synths. Goran Manojlovic (Sonos Studios) on bass and vocals and his brother Aleks Manojlovic (Leks Mano) on drums. They released an EP ‘Two by Four’ with 5 tracks, the release is a showcase of the diversity of their sound and runs the gamut from acoustic folk to electro punk to indie. A music video was commissioned for their single ‘Clap’ by Fly on The Wall productions in collaboration with Ontwerp (the post production company responsible for the visual effects on the LARK moonlight music video). The video is a perfect visual representation of the band’s attitude and irreverence: paper fish and mammals careen around the city of Cape Town while the band shrunken to fit performs on the cities post boxes, garbage cans and pavements. 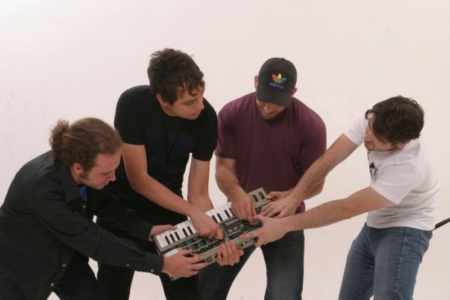 In October 2007 they released their second music video for the track ‘It’s All About’ in association with LEVIS Young Guns, Oppikoppi and Chasing Migada Productions. In November 2007 the band went into studio to record their first full length album and came out 3 months later with their 11 track album titled “Phosphenes” (when you push hard onto your eye balls the colour illusions that start to develop in a kaleidoscopic pattern are called Phosphenes). Matt has been operating under the internationally recognised trance alias ‘Artifakt‘ with Timecode Records and has performed all over the world, recently back from his US tour Matt has joined the rest of the band in studio to record their debut full length album. Goran is co-founder of the UNIT.R concept (which began as a record label) with Justin. He has DJ’d and performed alongside electro legends like Miss Kittin and Ectomorph and is co owner of the music and sound production workshop SONOS STUDIOS with Justin and Paul Ressel aka Humanizer from LARK. Aleksandar, a multi-instrumentalist and is not only a uniquely talented drummer, but is skilled at guitar, bass, piano and a turntables. He has been featured in music documentaries and recently included on DJ Redwood’s latest compilation as Leks Mano.